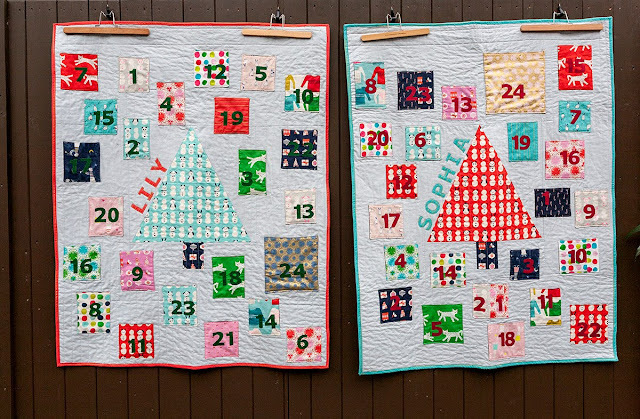 As so often it was a rush in the end but I did manage to finish the 2nd of the Advent Calenders for my lovely nieces Sophia and Lily a few weeks back and they are now hanging in their respective rooms filled with treasures and raided with much anticipation every morning. I really enjoyed making these and am very happy with how they have turned out, knowing they will bring them joy for many years to come. In fact my nephew for whom I made one in 2011 is now 9 years old and only recently started to feel a little to "grown up" for it. Frankly he used it way more years than I anticipated. And with that I am singing off for this year and would like to wish everybody reading this blog a very happy Christmas and New Year and much creativity to come in 2018. Thank you for visiting and reading about my creative adventures. Previous posts on the progress of the Advent Calendars calendars can be found here and here. I agree, I think the Advent calendars will be used for many years, even by your 'grown-up' nephew! Merry Christmas Judith!